This is a guest post from Jacqui, the writer of The Scholarly Nail's Wax Blog, which I used religiously to cut my wax teeth on. Jacqui is a sweet friend and I am thankful she took the time to write for me while I am away. Enjoy! Hello waxy world! A lot of you probably don't know me, so allow me to introduce myself. I'm Jacqui, and I used to be a wax blogger. It's been well over a year since I've done a proper blog post and even then, my posts were pretty infrequent. So although I haven't been an involved member of the wax community for quite some time, I will always have a vigorous love for fragrance and scents. A discussion with a friend the other day left us with the conclusion: "how can you not be into stuff that smells good?" 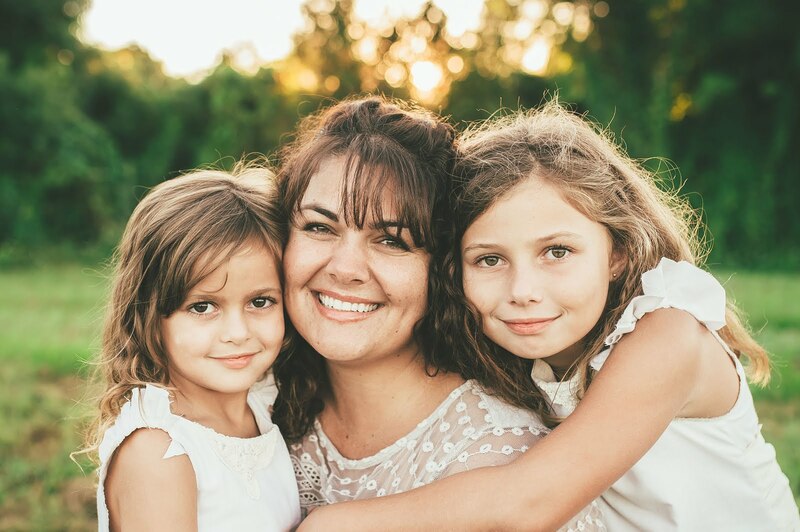 When Julie asked if I would like to do a guest post for her, I jumped at the chance. Julie is a bright light in the wax community, always kind, helpful and encouraging in a place where things can be unfriendly and sometimes downright intimidating for newcomers. I am grateful to call her a friend and happy to help her out while she is having a fabulous summer full of travels! Bon voyage J! I went back and forth about what I wanted to do for this post, but I ultimately decided on showing you all my wax stash and how I organize it. This was always a post I wanted to do for my blog but never got around to it. And let's be honest, who doesn't love seeing other people's stashes? 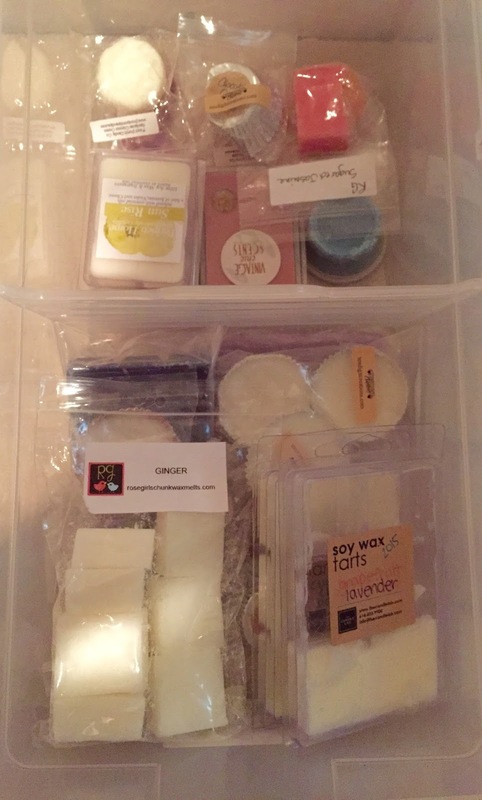 If you've caught up with me recently, you'll know that I downsized my wax stash considerably. 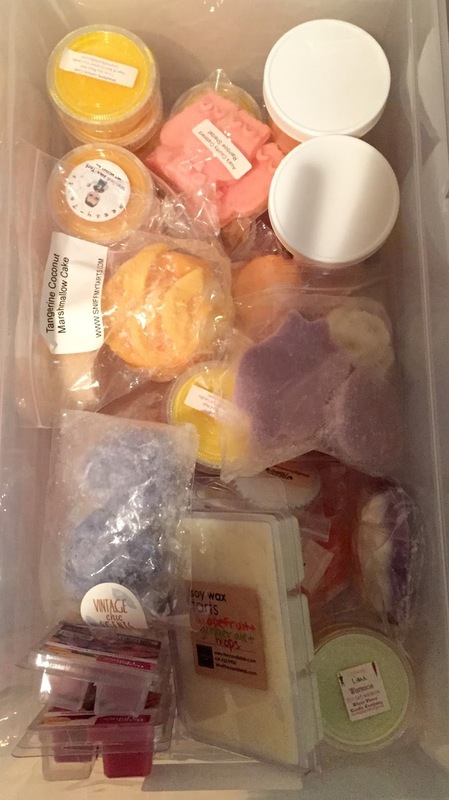 I used to have a whole coat closet filled with 24 different drawers filled with wax, each one overstuffed and barely able to close. Now, it's much more manageable and enjoyable to find something to melt. Don't get me wrong, it's still a pretty big stash. I don't know anyone in real life who would have a candle or tart stash anywhere close to this. But it's the perfect size for me! My life is a bit flip turned upside down at this moment in time. We are about a month out from completion of our home remodel, and we are living in our basement while they finish up. Though the end is in sight (FINALLY! ), we have most of our belongings packed up in storage and I don't have my DSLR with me right now. However, I have some barely adequate, dark and shadowy cell phone pictures taken in my basement for you all today! Hooray! At this point in time, I have 12 bins for my wax. They are not very deep (I can fit about 4 tart cups stacked in them) but are decently long. I bought them specifically for the small linen closet I will be storing them once we are back moved into the rest of our house. But for now, they are down here with us in the basement, living in a corner. I store my wax by scent, and I always have. I feel like my wax lasts longer this way, as if I'm preserving the integrity of the scents or something. It's probably all in my head, but it works for me. Also, whenever I feel like melting something, I never think to myself "Oh, I want to melt some Rosegirls or Ten Digit." I always think "I want my house to smell like oranges today." It just makes things much easier when I'm reaching for something to melt. 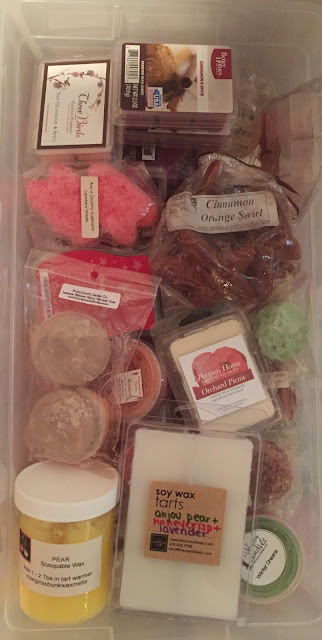 I went about 6 months from winter to spring not purchasing wax, but once spring had finally arrived I felt the urge to purchase some new scents and started bulking up my stash again. 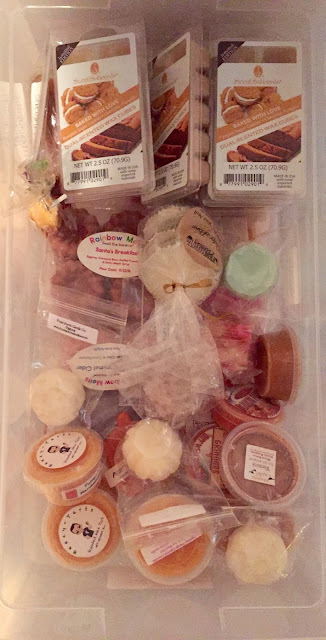 I have some bins that are pretty full, like my bakery bins. It's funny though, I barely reach for bakery these days. I'm hoping that once fall rolls around, I'll make a dent in my bakery bins. For now, I'm loving fruity scents and especially citrus. I was never much of an orange scent type of girl but now I can't get enough. Some bins, like my fresh/floral and "other fruity" bins are pretty bare. I would say that right now, the vendors that I purchase from most frequently Rosegirls, Ten Digit Creations and Lake Providence Lodge. LPL and TDC have a great TAT and great quality wax, while Rosegirls provides me with favorite scents that I can't get anywhere else. 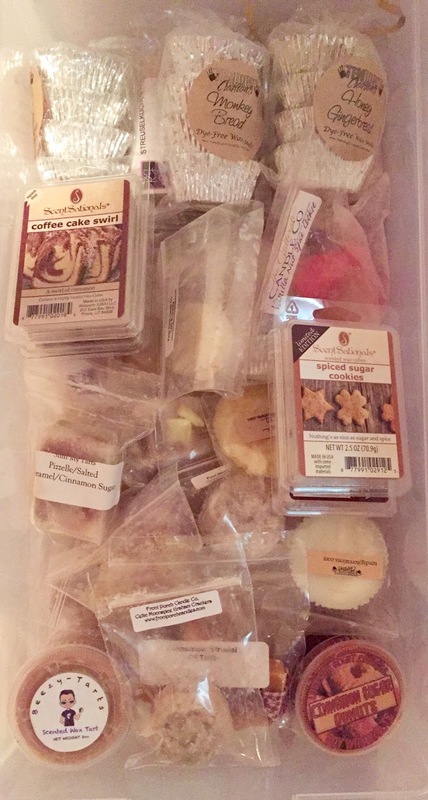 I've also purchased from Ava's Country Cupboard, Tiffany Candles and Front Porch lately, and am enjoying those vendors right now as well. I also placed an order from Dessa's. I was not in love with a lot of the scents I got but still have a few left to try again. I also purchased from VCS this spring to catch a couple favorite scents, but I can't see myself ordering much more from her because it's very difficult for me to catch her openings. I am definitely at a point where I am sticking to tried and true, easy to order favorites. I've also been very into local vendors lately. There is a store about an hour and half away from me called The Candle Lab. It is an amazing concept where you can go and mix your own candles and tarts. We just were down there last weekend with friends, and I came back with a bunch of giant clamshells! Another local vendor I have been enjoying lately is called The Pauper's Kottage, who I discovered on a trip to Amish Country a few years ago. We've also been enjoying going to lots of local flea and vendor markets this summer and have found some amazing wax vendors there as well. I swear I always seek out wax everywhere I go. In the past year, I've found amazing wax in Hawaii, New Orleans, Colorado and even in Mexico! Moral of the story - there is a whole world out there outside of online wax vendors. I have found some really GOOD stuff. 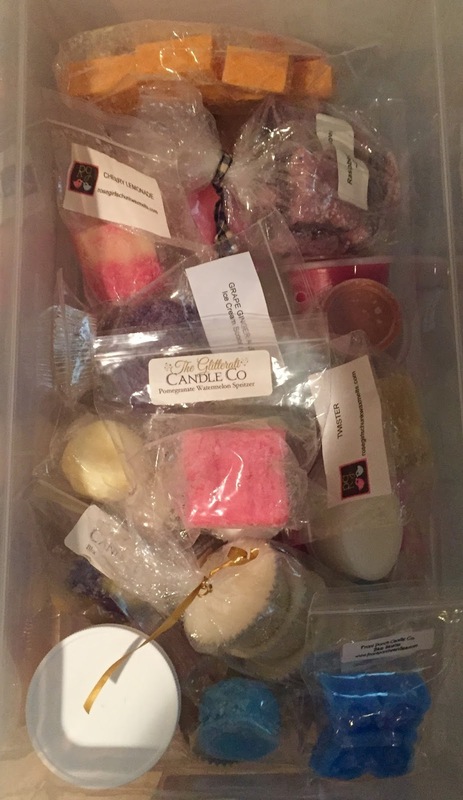 Do some research about candle and wax makers in your area, you may be surprised what you find! Basically any other online vendor wax that you see in these bins was purchased last year or earlier. I am a firm believer that wax can last a long time if it's stored properly and get great results from wax that is often a year or two old. 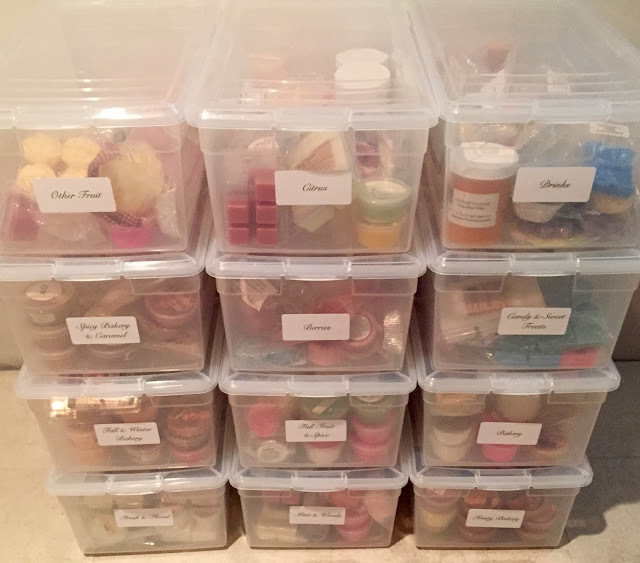 So now I will give you a peek inside each of my wax bins, highlighting a few favorite scents in each one and some thoughts about those scents. Enjoy! Candle Lab Grapefruit/Ginger Ale/Hops (just finished up my last clamshell of this, had to make it again, so unbelievably strong, yes that's the hops used in beer), Sugar and Spice Lemon Curd (love this scent from every vendor but happen to have from S&S right now, best lemon ever with the perfect mix of sweet and tart), Beezy Satsuma (some satsuma scents are bitter, Beezy's is perfectly sweet and smells exactly like The Body Shop version), and LPL Glazed Orange Cake (technically a bakery scent but I put it in this bin because it's such a wonderful orange scent with a hint of creamy spice). Whew! I hope you all enjoyed this journey into my wax collection. I'd love to hear how you all store your wax also! Thanks so much Julie for allowing me to guest post! Great post! I love to see how you have your wax organized. It really has inspired me to change I how I organize my wax. I see new bins in my future. Thanks Jackie! I always loved seeing how people had their wax stored too, I'm a neat freak so organization in general is fascinating to me lol =) Thanks for reading, you'll have to keep us posted on your wax re-organization! Ooh, we have a Candle Lab here in Columbus OH. I love this wax storage post - your stash is enviable for sure! I wish you'd go back to blogging, Jacqui! Hi V! The Candle Lab in Columbus is the one I'm referring to! We always go to the one in the Short North but I'd love to visit the other 2 locations soon. I'd love to hear what creations you've made at the Lab! Perhaps one day we can meet up there. Shoot me an e-mail =) Thanks for reading! OMG, just got so excited to realize that one of my favorite bloggers of all time is in my area! I'll shoot you an email post haste, darling! oh wow! that's an amazing stash!! Hi Ashley! That sounds like a great way to sort your stash too! Back in the days when my stash was out of control and I had two bins for each scent category, I'd do one drawer with bags and the other with scent shots and clams and it worked really well. I always found that smaller items would get lost in with the bigger items. Thanks for reading Ashley and for sharing your organization techniques! I looooooooooooooooooove this post! 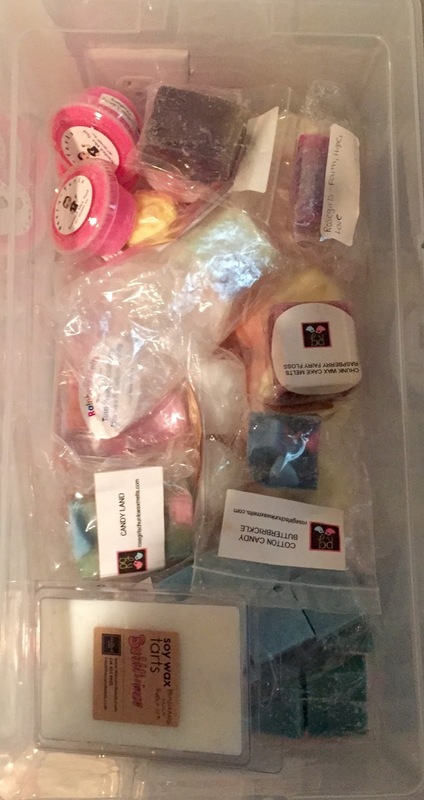 WOW!~ Your stash is so awesomely organized, Jacqui! Thanks for the ideas about your favs, I can't wait to try some of these. Maybe I need to rethinking how I separate, by vendor! Hey hey girl! 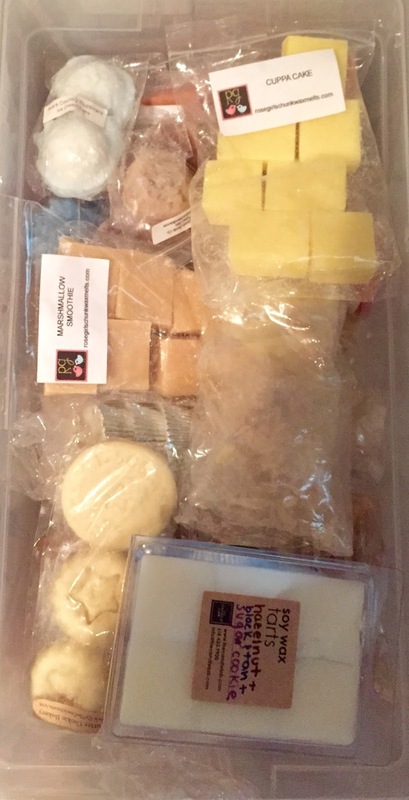 I had found that a lot in the FB wax community seemed to organize by vendor, it definitely seems to work well for a lot of people! Another thing I love about storing by scent is that it helps me when I'm looking to purchase wax. When I see what bins are getting low, it gives me a bit of incentive to order more from that category and then hold off on other categories where the bins are overflowing (like bakery, for example). 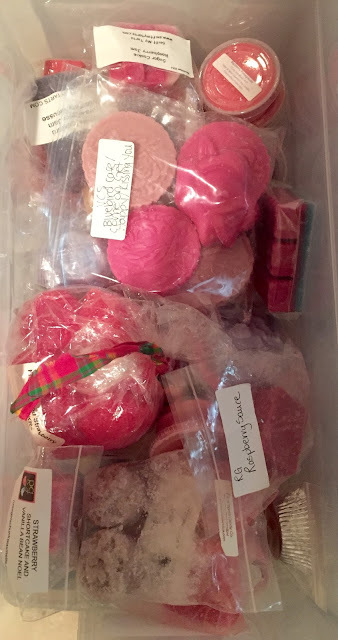 I would LOVE to see a stash post on your blog one day =) Thanks for reading Lauren! Loved reading this :) <3 I need to purge & organize! Hope all is well. 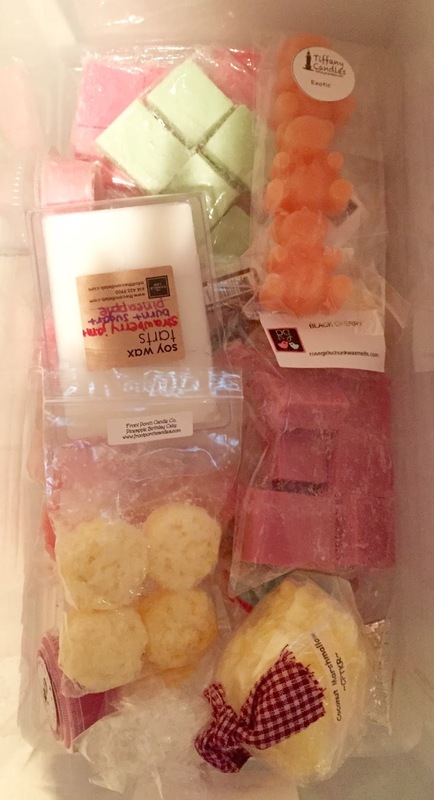 What an amazing post, thank you for the peek into your wax world. I must say, I am having serious thoughts about re-organising my stash now that I have seen yours. 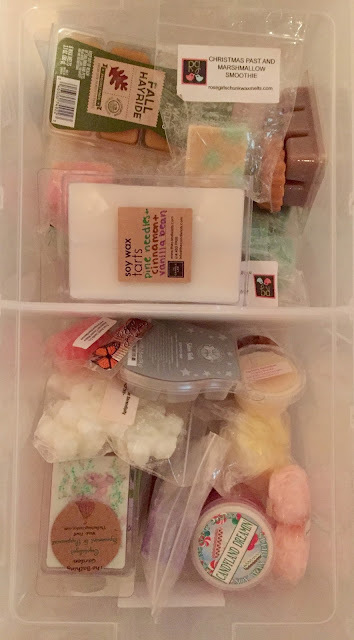 I have been a little frustrated lately rooting through my boxes to find a certain scent type that I am craving for the day.